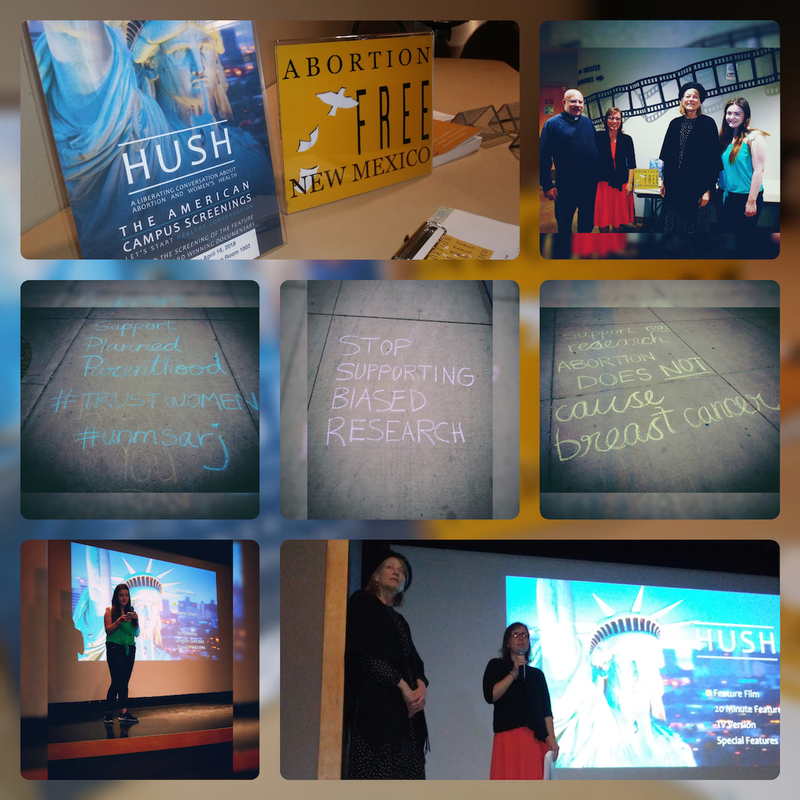 Albuquerque, NM- Abortion Free New Mexico and Students for Life UNM hosted a FREE screening of the HUSH – Feature Documentary and held a Q&A session afterwards at The University of New Mexico – UNM. This event was not Pro-Choice vs. Pro-Life… but PRO-INFORMATION! 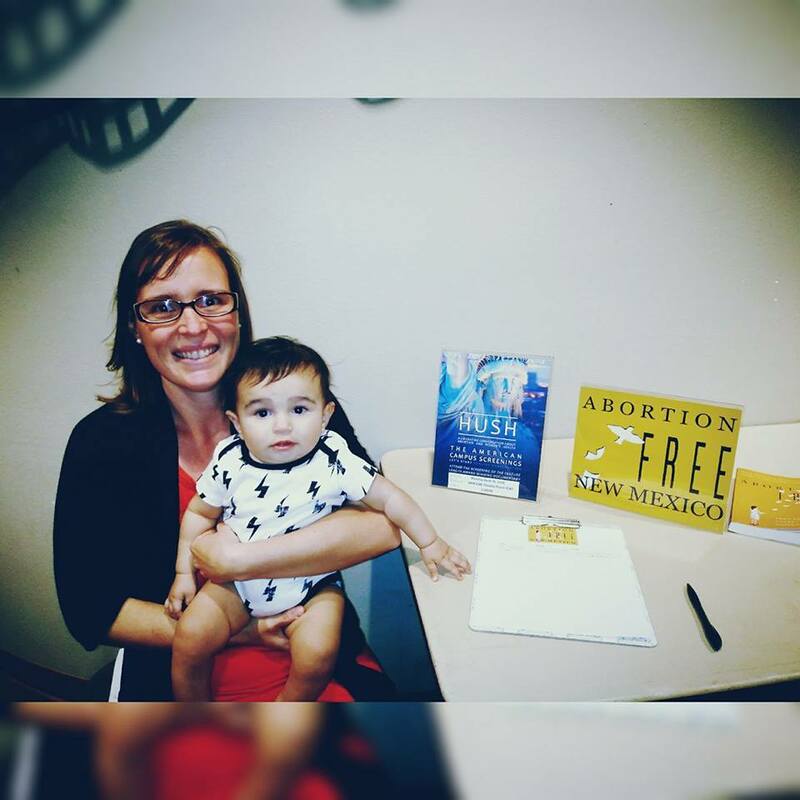 We extended an invitation to several pro-abortion student groups at UNM and even asked them to include a physician of their “Choice” for the Q&A session…but they only showed up to protest and steal ALL of our information off our table! “Abortion always ends the life of a child, but women have no idea how abortion will effect them in the years to come. The majority of ‘pro-choice’ proponents and abortion mills in this nation are not informing women of the true nature of abortion when it pertains to women’s health. This is why I applaud Punam Kumar Gill, the director, of HUSHfilm.com and the producers who had the courage and strength to go against the tide amongst her own ‘pro-choice’ community. The information presented in HUSH is invaluable and relevant in today’s culture where abortion is used as birth control and is often the only choice that women with unplanned pregnancies are offered help for among the radicalized ‘pro-choice’ community. I’ve witnessed this firsthand. A few months ago I took a teenage pregnant mother to her first OBGYN prenatal appointment at a University of New Mexico health clinic. That morning right before her appointment she had an argument in the waiting room with her teenage boyfriend and when we were taken back to visit with a doctor this mom was visibly upset. Pregnancy can be a difficult and emotional time for any woman, but how do you think the doctor responded to this situation? Instead of providing positive reinforcement that this too shall pass, the University of New Mexico doctor immediately questioned if she wanted to keep the baby and assured her that she still had options and could terminate the pregnancy! If life throws the smallest curveball at a young mom who is pregnant the ‘pro-choice’ world tells her that having an abortion will somehow remedy her situation. However, all the abortion will do is rob her from indescribable joy and potentially leave her scarred both physically and emotionally in ways that are never explained to her beforehand. Jonah went undercover at 37 WEEKS into a late term abortion mill and was born totally healthy literally 2 days later!